Robotics is the science of designing and building machines (robots) that are directed by computers to perform tasks traditionally carried out by humans. The word robot comes from a play written in 1920 by the Czech author Karel Capek. Capek's R.U.R. (for Rossum's Universal Robots) is the story of an inventor who creates humanlike machines designed to take over many forms of human work. The origin of robotics can be traced back to early Egypt, where priests used steam-activated mechanisms to open temple doors. This action helped convince their followers of their "mystical" powers. Ancient Greeks, Chinese, and Ethiopians also experimented with steam-powered devices. In the late 1700s, Swiss brothers Pierre and Henri Jacquet-Droz created Jacquemarts, spring-powered mannequins that could play musical instruments, draw pictures, write, and strike the hours on clock bells. In 1892, Seward Babbitt invented the motorized crane that could reach into a furnace, grasp a hot ingot of steel, and place it where directed. Although none of these devises were true robots as we known them today, they represent the first steps of automation and robotics technology. Robots have come to play a widespread and crucial role in many industrial operations today. The work that robots do can be classified into three major categories: the assembly and finishing of products; the movement of materials and objects; and the performance of work in environmentally difficult or hazardous situations. Assembly and finishing of products. The most common single application of robots is in welding. About one-quarter of all robots used by industry have this function. Welding robots can have a variety of appearances, but they tend to consist of one large arm that can rotate in various directions. At the end of the arm is a welding gun that actually forms the weld between two pieces of metal. Closely related types of work now done by robots include cutting, grinding, polishing, drilling, sanding, painting, spraying, and otherwise treating the surface of a product. As with welding, activities of this kind are usually performed by one-armed robots that hang from the ceiling, project outward from a platform, or reach into a product from some other angle. Another example in which robots have replaced humans in industrial operations is on the assembly line. In many industrial plants today, the assembly line of humans has been replaced by an assembly line of robots that does the same job, but more safely and more efficiently. Movement of materials. Many industrial operations involve the lifting and moving of large, heavy objects over and over again. One way to perform these operations is with heavy machinery operated by human workers. But another method that is more efficient and safer is to substitute robots for the human-operated machinery. limbs of the exoskeleton. By operating the exoskeleton's controls, the human can magnify his or her strength many times, picking up and handling objects that would otherwise be much too heavy to lift. 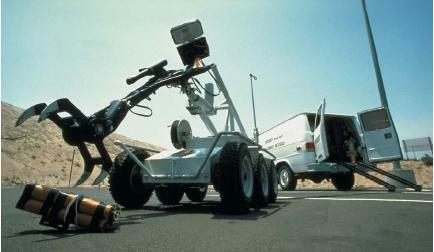 Hazardous or remote-duty robots. Robots are commonly used in places where humans can go only at risk to their own health or where they cannot go at all. Industries where nuclear materials are used often make use of robots so that human workers are not exposed to the dangerous effects of radiation. Robots have also been useful in space research. In 1976, the space probes Viking 1 and Viking 2 landed on the planet Mars. These two probes were some of the most complex and sophisticated robots ever built. Their job was to analyze the planet's surface. They did so by using a long arm to dig into the ground and take out samples of Martian soil. The soil samples were then transported to one of three chemical laboratories within the robot, where the soil underwent automated chemical analysis. The results of these analyses were then transmitted to receiving stations on Earth. Sophisticated robots are able to imitate some of the actions of humans because of three key components. First, they are able to respond to changes in the world around them by using visual or tactile (touch) sensors to obtain information. Second, they have a set of instructions (a program) implanted in their computer-brain giving them a core base of knowledge. Third, they are able to combine information from their senses with that in their computer-brain to make decisions and perform actions. In early 2001, scientists at a U.S. government national security laboratory provided a glimpse of the possible future of robots when they showed off what is perhaps the world's smallest robot. The diminutive robot weighs less than 1 ounce (28 grams) and is 0.25 cubic inch (4 cubic centimeters) in size. It can stop and almost sit on a dime. It sports track wheels similar to those on a tank and has an 8K ROM processor. The robot can be equipped with a camera, microphone, and a chemical micro-sensor, and in the future it may carry a miniature video camera and infrared or radio wireless two-way communications equipment. Scientist hope the robot (and others like it) may someday be used to perform a host of arduous tasks like disabling land mines or searching for lost humans. It could even be used in intelligence gathering. this article is really good... it shows in other aspects how much does robots could be benificial 2 human beigns..